AlphaTrader 2.7 is now available! With AlphaTrader 2.7, we have been very busy primarily at extending AlphaTrader connectivity, in term of brokerages or trading venues, data providers and trading simulators. We also significantly improved our trade modify workflow, and our indicator framework. Plus many other changes you can follow in our detailed release notes. the Interactive Broker (FIX + API) connectivity, for which we got officially certified by IB. the FXCM ECN Classic (FIX+API) connectivity, for which we also got certified by FXCM. You can have a summarized and updated view on all our connectivity options here. With AlphaTrader 2.7, we also integrated and partnered with the third-party data provider DTN IQFeed. IQFeed will give you access to real time Level I and Level II data, and to historical data from ticks to monthly bars on Futures, Equities, Indexes, Forex, etc. 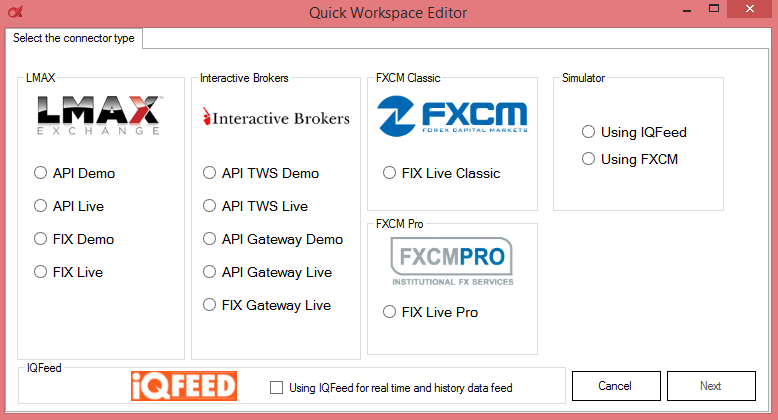 IQFeed data connectivity is particularly useful when associated to the Interactive Brokers connector which has several constraints on real time feeds (only snapshots) and historical data requests. 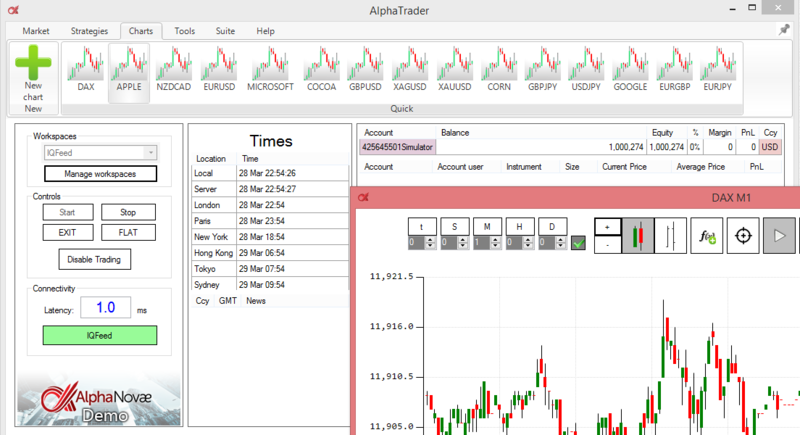 With AlphaTrader 2.7 we are also delivering trade simulators connectors associated to the IQFeed or FXCM market data feeds. So it is now possible to run your strategies or manual trading on our trading simulator to test them against real price feeds. No need of having a broker demo or paper trading accounts anymore to run your tests! It is now possible in your strategies to modify the trade size alongside the price limit or stop level, the stop loss, the take profit and the trade comment. AlphaTrader will manage itself the cancellations and re-booking or cancel/replace actions depending the connector used. We also took this opportunity to ship in AlphaTrader 2.7 many other workflow improvements. Cf release notes for more details. 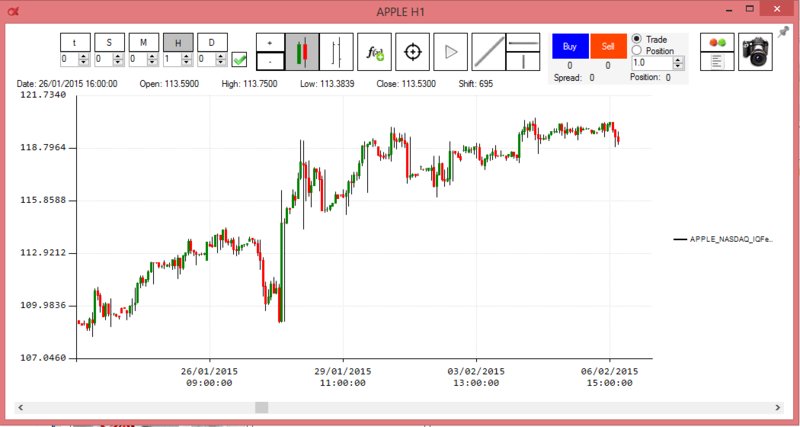 With AlphaTrader 2.7, we performed several improvements on the AlphaTrader indicator development framework. Following some client requests we did several ergonomy improvements. For example, we added on the charts visibility of the year, and we improved the Open / High / Low / Close / Shift display of the selected bar (cf Apple chart above). On AlgoNaute, we allow now multiple select of strategies (left check box) for bulk actions such as Pause / Reload / Remove. Cf image below. On AlgoNaute we also now display in grey strategies loading (warming up), meaning dowloading requested historical data and calculating indicators at initialisation. Cf image below.